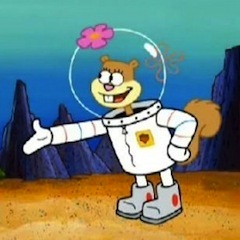 As the scientist squirrel with a Texas twang, Sandy Cheeks is one of the most important characters in the SpongeBob SquarePants series. Though her relationship with SpongeBob is a bit complicated, there’s certainly no lack of affection between the two. For kids watching this genius inventor, there are tons of valuable lessons to be learned; here are ten of the things that kids can take away from half an hour in the company of Sandy and her pals. Be Proud of Your Roots – One of the things that defines Sandy as a character is her staunch pride in her Texas homeland. She’s visited every city in the Lonestar State, and will go to great lengths to defend it if necessary. It’s Important to Be Physically Active – As the emphasis on helping kids to become more physically active grows stronger, Sandy serves as a great example for staying fit. As an avid karate student and weightlifter, she certainly doesn’t lead a sedentary lifestyle. Friends Help One Another – When SpongeBob goes missing, Sandy launches an exhaustive search expedition, even sending searchers to dangerous places in order to rescue her lost friend. Though wandering into danger isn’t a good lesson for little ones, the message that we should all look out for our friends is. Don’t Overestimate Yourself – Though SpongeBob tries to warn her about the Alaskan Bull Worm, Sandy’s cockiness prevents her from taking his advice. This overconfidence later leads to her being proven wrong; kids can take away a valuable lesson about overestimating our abilities. Love Makes Us Do Crazy Things – Fans of the show all seem to agree that there’s more than a simple friendship between Sandy and SpongeBob. Proof of this comes in the form of Sandy’s willingness to sacrifice herself to a monster in order to save SpongeBob, teaching kids that love can make us do crazy things. Even Geniuses Make Mistakes – Despite being a genius who’s easily capable of inventing any thing she needs, Sandy has been known to make mistakes. Confusion surrounding the way that sea creatures breathe in an early episode can show kids that even the smartest people sometimes get stumped. Homesickness is Real Sickness – Sandy loves and misses her home in Texas so much that she once considered leaving Bikini Bottom to go back. Though she eventually decided to stay, the lesson that homesickness can affect your perspective is passed on to young viewers. Standing Up For the Things That You Love is Important – Though kids certainly shouldn’t emulate her tendency to defend her beloved Texas with physical violence, watching the good-natured Sandy defend something she loves is a great way for kids to learn that standing up for the things we care about is a good thing. Being Too Competitive Can Be Dangerous – In a bid to prove that land creatures are better than sea creatures borne out of Sandy’s extreme competitive streak, she almost finds herself in very real danger. Kids watching learn the difference between being competitive and too competitive, seeing her in action. Home is the One Place Where You Can Be Yourself – Under a polyurethane Treedome, Sandy is able to move about without her diving suit and helmet, proving that home is the one place where we can all let our hair down and be ourselves. Besides cartoons be a simple entertainment avenue, we can also make use of the scenarios and characters as teaching tools for character lessons for our kids. It just takes a little thought on how to make the application.